This country is so easy to get around with buses from the main bus station in Quito going to every destination in the country nearly every ½ hour. The coast of Ecuador from Manta to Guayaquil has beautiful warm clear waters and small off shore islands to go snorkelling for a day. From Quito you can do the equator or go to places like Banos and of course many more. Mountains are close and rivers for rafting. Ecuador seems to have it all. Amongst all the fruit you can buy I found Banana Passionfruit. I had heaps of people at the hostel eating them as they had never come across them before. In New Zealand the banana passionfruit vine is now considered a noxious weed. In Ecuador they are taking over and grow just everywhere. Best hostel in Quito is ‘Secret Garden. Breakfast is about $5 but its as much as you can eat and they also do a tradional Ecuadorian meal every night which is about the same price. They also have live music one night a week. You will find yourself with endless places to go and endless activities to enjoy. This is another country so set up for tourists and its not hard to find out anything you want to know. Second to none of course are the Galapagos Islands. If your budget allows, don’t miss them! It is an amazing experience to snorkel with turtles and fur seals. The waters are warm and clear and surprisingly calm. I could snorkel not more than 1metre from the rocks and when I got close, would just push myself back out a little. There are blue–footed boobies and the albatross (males ) sitting on the nests. You can get very close to take photos. Then there are the many hundreds of iguanas. Ugly things I think, and not as big as I thought they were. Flamingos.……. The ship I went on was great, as was the service, and each morning you woke to find yourself at a different island. The Charles Darwin Research Centre is where you get to see the enormous turtles. It takes 8 men to lift one. Personally I think they lied, and that it must take as many as 10 of even 12. You are allowed to get right next to them but no touching. I still think today WOW and I would love to take everyone there to see the Galapagos. Ecuador is another country I will revisit. Mind you I think the whole of South America is great and that I will go back to all the countries there many more times. Watch your belongings in this country. If you put it down they think it belongs to them and ‘bang’ it’s gone. If robbed, get on the phone quick. My room was broken into ( I wasn’t to realise this until sometime later as it was done in such a way that I didn’t immediately know ) and by the time I got on the phone they had cashed us$4000.00 And no, they didn’t get my passport. I little obvious that they knew the person that worked in the bank. The hostel I stayed in at Quito did spanish lessons. The tutors came to the hostel. If your hostel runs this service take advantage of it. This proved helpful for me as I hired one of the tutors to be my interpreter for getting the police report after being robbed. The people like it if you attempt to speak in spanish. I still have to do a bit of pointing and other hand gestures to get understood, but hey it makes for a bit of fun and laughter. Before going to Ecuador make sure your budget allows for the Galapagos Islands. It would be a shame to go all that way and to miss them. It is an unforgettable place. Don’t forget a visit somewhere along the coast. The beaches are beautiful and the water so clear. Do the Teleforica when in Quito. Amazing views over the city. Remember you are at altitude and its hard work just walking so take your time. Make a point of going on a bus to a small town within an hour or so of Quito each day. Buses are going to somewhere all the time and this is an easy way to do the equator. Visit the Otavalo markets. This is something to remember for life. Just like in Bolivia – if travelling alone put your bag in the backseat with you. If the taxi driver tries to say no it will be because he wants to fill the vehicle up with others and there is no way of knowing where you will get taken before being dropped off, or the cost. 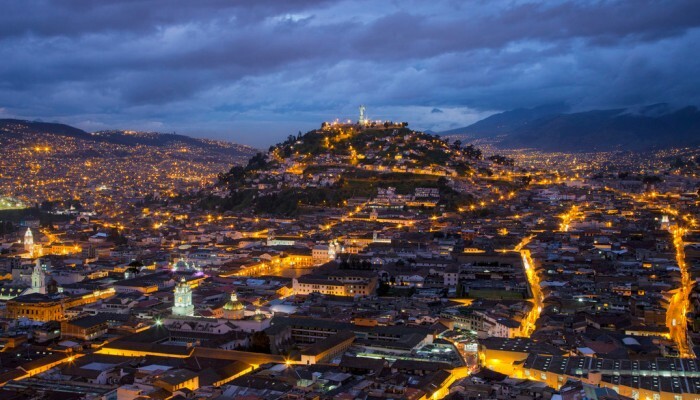 Remember that Quito is at altitude so dont try to do to much the first day or so. Euro Kody Copyright © 2019.